Engadget is the original home for technology news and reviews. Since our founding in 2004, we’ve grown from an exhaustive source for consumer tech news to a global multimedia organization covering the intersection of technology, gaming and entertainment. Today, Engadget hosts the archives and expertise of early digital publishing players like Joystiq, TUAW and gdgt, and produces the Internet’s most compelling videos, reviews, features and breaking news about the people, products and ideas shaping our world. After 13 years in the game, we’re leveraging our history to bring the future into focus. India is a land of many mysteries and charms, even for those who think they’ve been everywhere and done everything. If you’re an intrepid traveller looking for offbeat destinations that are far removed from the tourist trail, read on. In this list you’ll find hidden mountain getaways, a haunted fort, a magnetic hill and a fascinating lake that’s littered with skeletons. Some of these destinations may be hard to reach but they are well worth the effort as I found out. As a society, we often fail to distinguish between fact and myth. And the row around Sanjay Leela Bhansali’s Padmavati and the alleged misrepresentation of the apparently fictional Rajput queen Padmini in it, is a great example of the same. It is meaningless to argue whether Padmini existed or not. It is equally pointless to argue if her representation in the film (which none have seen) is inaccurate or offensive. She is a well-regarded icon for some and a mere myth for others. It is, however, important to consider what the objections to Padmini’s portrayal have to do with privilege, power and politics of a certain kind. Last Wednesday, the day before the general election, I casually popped a little note on social media. That message exploded. I’ve had posts go viral before, but this was by far the biggest. So I thought it would be interesting to bash out the stats of the tweet, and try to explore why this message triggered the instinct to share when others – whether about the election or not – didn’t. The most important ‘viralness’ metric is the number of retweets, as that’s how many people republished it to their own followers. This included hundreds of ‘verified’ accounts many with substantial followings such as @achrisevans or @GemmaAnneStyles. What’s called a retweet on Twitter is a share on Facebook. As you can see, these triple the Twitter RT numbers. Sadly my Facebook account doesn’t give me access to details of the post’s reach (the only other stat I have is there were 2,000+ comments). Yet as a very clumsy and inexact method, if we take the same multiplier or ‘shares to reach’ as Twitter, this post had over 15 million impressions. The feedback on the tweet was mostly strong, including huge numbers of relieved messages such as “Phew, I couldn’t find my card since refurbishing”, and others indicating they were relieved having seen it, and it encouraged them to vote. The little criticism that came was from those who felt the message implied not to take your card, whereas actually having a polling card with you can make the process quicker (I took mine). Though some people who were acting as election tellers wrote back saying it really wasn’t a problem. 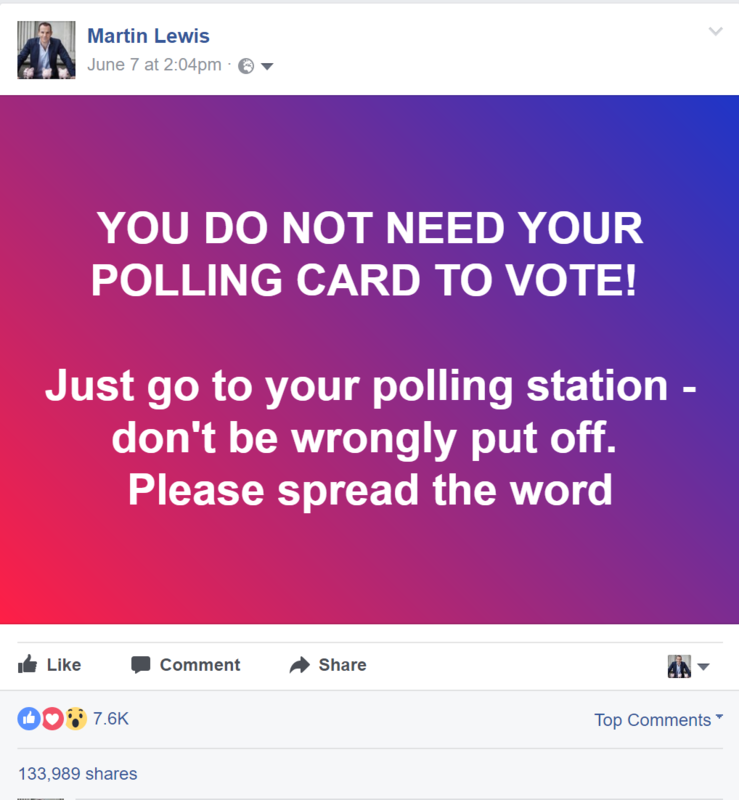 I did hear one report from a teller from someone who hadn’t been registered to vote turning up as “Martin Lewis says I don’t need a polling card”. That’s a shame – I think they must’ve misread the message, but as this was all done long after registration closed, I’m at least comfortable they hadn’t thought it meant they needn’t register. The post wasn’t calculated or designed to go viral. I suspect that is an advantage. Trying to make something viral would likely feel contrived. Having said that it’s still worth trying to work out why this particular message hit the ‘share it’ touch paper. Of course that doesn’t mean following these rules will automatically result in another viral message – but it could help focus and increase the range of your social media posts. These are just my reasons though, if you disagree or have other thoughts, I’d love to hear them in the discussion at the end. It had near universal application. The huge majority of UK over 18-year-olds are registered to vote. Turnout in the election was 68%. Even though my normal posts have a wide range, talking about credit cards, savings or mortgages – the constituency of this one was far larger. It was pegged on the topic of the moment. The general election is big news. We have saturation coverage and it’s the current water-cooler conversation. Therefore rather than trying to create a new story, this message was piggybacking off the zeitgeist of the day. It was a very simple, factual message. There’s no complexity, just an easy fact to understand. The impact is obvious. Immediately on reading the first line you can quickly understand why it matters. And then within the tweet I’d reinforced this with the line “Don’t be wrongly put off”. A trusted source. Hopefully I don’t sound a prat for writing this about myself. Yet I’m known and trusted to provide factual information (to provide an example of a source for that, see this Spectator article). When you get an information tweet like this, if there’s even a little doubt about the source, people won’t retweet – so the information provider has to resonate with the information. It had the ‘I didn’t know that’ factor. While of course some people know this (some people know everything! ), reading the responses many were unsure. In fact some even responded to double-check with questions like, “Then why do they send it to you?” (It’s to confirm you’re registered and inform you of which your polling station is.) When people receive something they didn’t know before, the discovery factor makes them more likely to share it. There’s a level of public service – doing one’s duty. Many people, including me, feel engaged and protective of our democratic process and the right to vote. With that comes an almost evangelical zeal to make sure it goes right. This tapped into that. The reason behind this is with duty free you’re potentially being exempted from duty as well as tax. If you travel outside the EU, while other shops only get an exemption on VAT, duty-free stores can also sell goods such as tobacco and alcohol free from UK excise duty. Of course that doesn’t automatically mean they are cheaper than you can buy elsewhere. Q. What counts as a duty-free shop? As they’re the only ones that can advertise goods as ‘duty free’, they’re the ones that do that. In practice most duty-free shops are called ‘duty free’ and sell alcohol or tobacco. Q. Are tax-free shops the same as duty free? No, they aren’t, and in the words of HMRC, “Other retailers are known as tax-free shops… There is nothing in VAT law that requires a traveller to produce a boarding pass to purchase goods.” Though of course without proof they cannot claim the VAT exemption if you’re travelling outside the EU – which is why they ask. Q. If it’s somewhere I don’t legally need to show my boarding pass, can they refuse to serve me if I won’t show it? Yes, any shop can refuse your custom (unless it’s doing it for discriminatory purposes, eg, over race) so there is a chance this will happen – or at least its procedures won’t allow it. Q. If a shop doesn’t need to see my card, but wants to, is there any harm in showing it them? Not directly, no. The reason I suggest not showing it is part of a campaign to get airport stores to pass on the VAT gain they get from non-EU customers – as the Government indicates they should. Already this has paid dividends with the change in policy from Boots and WHSmith as mentioned in the video – I would hope to see them go further and other stores join. Right hello. I’m at Gatwick Airport and I’m airside so I’m filming this on my phone and keeping rather quiet if you know what I mean because I want to answer one of those questions that people always ask me about travelling. “When they ask for my boarding pass when I’m buying stuff in the airport, do I have to show them?” Well, the answer… no. On almost all the shops, with one big exception, duty free. In duty free, by regulation, they have to see your boarding pass or they can’t sell you stuff, so don’t give the staff in there a hard time, show them your boarding pass. But for the rest of the shops in here and all around here, well, the answer… no. And the reason they’re asking you is if you show your boarding pass and you’re going outside of the European Union well, then they can claim the VAT back. Now I believe they should be sharing that with you and they’re not. So if they ask you, just say no. Why should they gain if we don’t? However, there have been some moves on this, down the bottom there you’ve got WHSmith and Boots. Shop in either of those, in Boots buying something over a fiver and in Smith’s over £6, they will give you the VAT back if you show your boarding pass and you’re travelling outside the EU, but only on items over a fiver or £6, not the total basket. So it’s up to you to decide whether you want to give them your boarding pass or not. 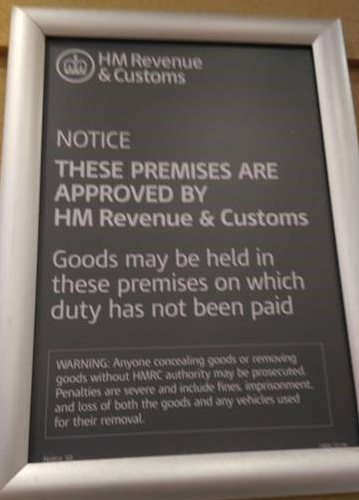 They can’t stop you buying stuff, there’s no law requiring them to see it, with the exception again of in duty free, over there.